One of the world’s oldest powerboat trophies, the Dupree Cup, is set to become the official trophy of the round-the-world record. 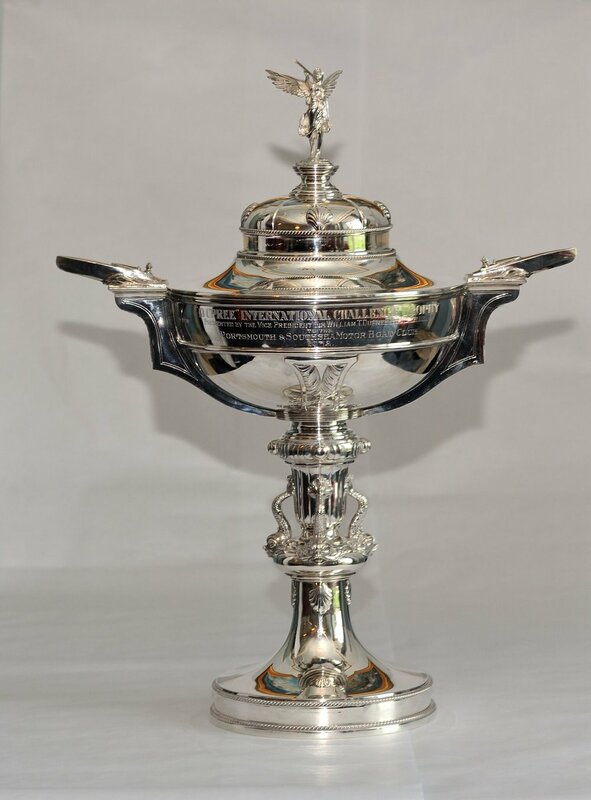 The magnificent solid silver trophy will be rededicated at an official ceremony, next week, at the Royal Naval Club and Royal Albert Yacht Club in Portsmouth. The trophy was donated to the Club by brewing magnate Colonel Sir William Dupree, 1st Baronet in 1932, but it pre-dates this and was made in 1913. It was awarded to the winners of the Portsmouth and Southsea Powerboat race and was used until just before the outbreak of the Second World War. It was thought lost, after the then Club Secretary, fearing a Nazi invasion took the precaution of hiding the valuable award in 1940, but died before the end of the conflict. However in 1980s as builders carried out renovation work to the Queens Hotel in Southsea, Hampshire, the trophy along with a hoard of other valuables were discovered hidden in a chimneybreast. Despite sustaining damage it went on display at the RNC & RAYC, until last year when thanks to a generous donation from Team Britannia it was restored to its full glory in preparation for the rededication. Simon Wright-Cooper the current Club Secretary, commented: “We are absolutely delighted to be able to rededicate this historic trophy for use as the round the world powerboating cup. The trophy is believed to be the second oldest powerboat trophy still in use, only surpassed by the British International Harmsworth Trophy, first presented in 1903 by Sir Alfred Harmsworth, former proprietor of the Daily Mail. It predates the famous Segrave Trophy from 1930, which commemorates the life of Sir Henry Segrave. A former fighter pilot in World War I, who went on to become Britain's top motor racing driver of the era. The Seagrave Trophy is awarded annually to a British subject who accomplishes the most outstanding demonstration of transportation by land, air or water. Team Britannia’s skipper and ocean racing legend, Alan Priddy, added: “This is a great honour. Sir William and his family were true pioneers of the sport and this trophy, the oldest powerboating cup in the world, is a testament of their role and contribution to the sport. “It is a double honour as Sir William, made his home in Portsmouth, was a former Mayor (three times) and Alderman of the City. He owned Portsmouth United Brewery, gave generously to charity and served his country in the armed forces with distinction, rising to the rank of Colonel.